Turnout jumped from 15.7% four years ago to 27.3% in recent municipal runoffs; in congressional race, counties voting by mail see higher participation than others. 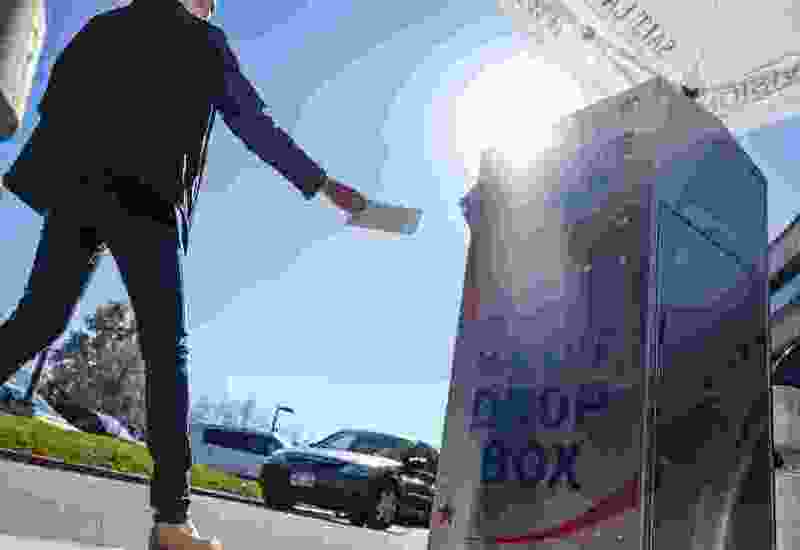 (Francisco Kjolseth | The Salt Lake Tribune) Voting by mail helped to double the turnout in this year's municipal primary in Salt Lake County. In Utah’s 3rd Congressional District, where Provo Mayor John Curtis won the Republican nomination, only two of the seven counties did not vote by mail. And turnout there was far lower in those two than elsewhere. “It shows again that voting by mail does what we thought it would — increase turnout,” said Mark Thomas, state elections director for Lt. Gov. Spencer Cox. Cox’s office on Thursday completed the final vote canvass in the congressional primary, confirming Curtis’ victory with 43 percent of the vote. Former state Rep. Chris Herrod finished second with 33 percent and political newcomer Tanner Ainge finished last, with 24 percent. The districtwide turnout was 40 percent of registered Republicans. In the two counties that did not vote by mail, turnout was a mere 26 percent in Emery County and 29 percent in Carbon. Elsewhere, turnout was 56 percent in Grand County; 49 percent in San Juan; 43 percent in Salt Lake; 41 percent in Wasatch; and 39 percent in Utah County. “We’re starting to see a pattern,” Thomas said. In last year’s general election, 21 counties voted by mail — and all of them had higher turnout than the eight that did not. More evidence that voting-by-mail increases turnout came in Salt Lake County — where it nearly doubled in municipal elections this year compared to four years ago, from 15.7 percent to 27.3 percent, said County Clerk Sherrie Swensen. While she said some of the increase may have come from interest in the 3rd Congressional District race that involved some of the cities, turnout was still significantly higher in other areas, too. For example, the mayor’s race in Taylorsville — which is outside the 3rd District — saw turnout nearly double, from 15.5 percent four years ago to 29.4 percent this year, she said. Turnout spikes in some other mayoral races this year compared to 2013 included: Herriman, from 15 percent to 21.8 percent; South Jordan, from 19.2 percent to 26 percent; Midvale, from 16.9 percent to 27.8 percent; Murray, from 22.9 percent to 36.6 percent; South Salt Lake, from 23.6 percent to 30.3 percent; and West Valley City, from 15.9 percent to 24.2 percent. “Even though the turnout is still less than I’d like to see it, every single city with vote by mail increased turnout,” Swensen said. Thomas and Swensen say voting by mail increases turnout because it is more convenient for most voters. Residents may vote whenever they like over several weeks and drop the ballot in the mail. Swensen said as voters grow more accustomed to casting ballots by mail, fewer are using alternatives — such as in-person voting in city halls, or in-person voting on Election Day. Thomas says there are challenges with vote by mail and that county clerks need to be extra careful that they mail out the proper ballots. Utah County and Wasatch County made mistakes this year, mailing out GOP congressional primary ballots to unaffiliated voters who weren’t eligible to vote. In the case of Utah County, 68,000 ballots were erroneously mailed. “You don’t get a second chance with vote by mail,” Thomas said. Also, vote by mail can result in delays in knowing who winners are in close races on election night — because officials need to wait for late ballots to arrive over several days. In Salt Lake County this year, final winners were different than election-night leaders in three of 29 municipal races — even though about a quarter of all votes cast (more than 23,000) were counted after Election Day. In the Cottonwood Heights City Council District 3 race, Talia Bruce trailed Tonia Dalton by nine votes on election night for the second and final qualifying spot for the general election — but Bruce ended up winning instead by 16 votes. In the Herriman City Council District 2 race, Jared Richardson ended up winning the second qualifying sport after trailing Melissa John on election night. And in the Salt Lake City Council District 5 race, George Chapman won the second qualifying spot after trailing Benjamin Rosenberg on election night. Correction: An earlier version of the story misstated how many voting centers Salt Lake County had on Election Day in 2016. It was 37.